I just had to write an update to my Mother’s Day Post from yesterday, “Mother’s Day and The Macaroni Necklace”. DC loves to draw and he does draw quite a few pictures for me. His favorite subjects are flowers, cakes and once in a while, pizza. 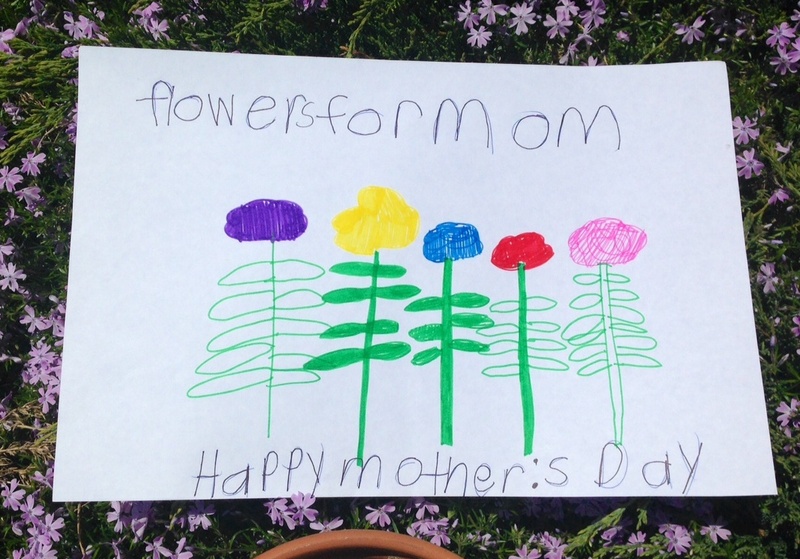 He draws pictures for me for no reason at times but usually his “Flowers for Mom” drawings are reserved for the times he thinks he is in trouble and the times he IS in trouble. When you see “Flowers for Mom” pictures laying about when you walk into my house, chances are DC is in trouble for something. He never draws for a holiday or birthday, unless it is suggested to him. Less than 12 hours after I wrote..
“His mind still doesn’t go to “Hey let’s make Mom a card or a gift for Mother’s Day”, DC woke up and the very first thing out of his mouth was, “Happy Mother’s Day, Mom!”. We went to the kitchen and I started making coffee, I turned around and there was DC at the table drawing. He stopped when he saw me look at him as if I wasn’t supposed to see; “Sorry, Buddy, I won’t look”, and he continued on. A few minutes later he presented me with this picture, with no prompting and no one to tell him it what a good idea it might be! Less than 12 hours after I wrote….. HAPPY MOTHERS DAY! You so deserve to enjoy this, and all the other, victories. Thank you so much! I hope you had a Happy Mother’s Day as well. Thank you for reading. Thank you for reading and for your comment. I am at work right now but I will definitely check out your link a little later. Thanks again! I can’t wait to have you there have a great day!